I found this wonderful idea on the internet to make your very own wind chimes out of old tin cans. Click here to visit their website and find all sorts of wonderful crafty things to make and do. Here's how to make your very own DIY Wind Chimes. Remember you must ask a grown-up to help. Use a hammer and nail to poke a hole in the bottom of each. Beginning with the largest, stack the cans. Measure a length of heavyweight string equal to the height of the cans, plus about 1 metre. Knot a wooden ring onto one end of the string. Thread the other end up through the hole in the smallest can. Add the other cans in the same way, making sure they overlap slightly so they'll chime. From the excess string, form a hanging loop (about 25cm long) above the largest can. I love the idea of recycling things to make lovely new things to enjoy. It's very clever and good for the planet too. 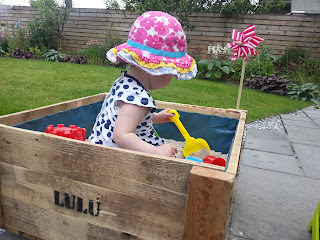 M&D have made lots of wonderful things out of old pallets. Click here to read a blog they have written about things you can make out of recycled pallets (3.) My absolute favourite is my sand pit! Have fun with your recycling of things for the garden. I would love to see your own projects - email me pictures of your own creations and I will share them on my blog. 1. This means you have to eat yummy food before you can make this, bonus!